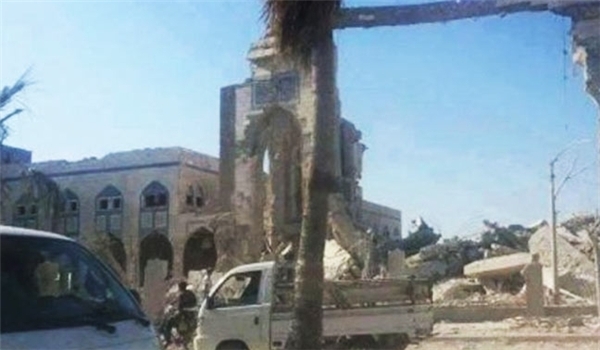 JNN 18 May 2014 Damascus : Saudi sponsored Takfiri terrorists operating in Syria destroyed a Holy shrine in the northern province of Raqqa. The armed insurgents attacked the shrine of Uwais al-Qarani in yet another vicious act that they have demonstrated since the beginning of the foreign-hatched conflict in Syria. Raqqa province has been under the control of a Takfiri group known as the so-called Islamic State of Iraq and the Levant (ISIL) recently. In March, militants from an al-Qaeda splinter group have bombed a large Holy site highly revered By the Muslims , especially the Shia Sect, in the northern Syrian city of Raqqa. Photos of the mosque of Ammar bin Yasir and Uwais al-Qarani posted on the internet showed extensive damage to the exterior walls and roof of the site. Uwais al-Qarani also known as Saint Uwais al-Qarani, was an Arab,Muslim, mystic, martyr, and philosopher from Yemen. He lived during the lifetime of Prophet Muhammad PBUH , but never met Prophet Muhammad personally. As reported by the renowned historical scholar Ibn Battuta, Uwais was martyred in the Battle of Siffeen , 657 A.D , as a soldier in Imam Ali’s army. Uwais’s shrine where he is buried is in al-Raqqah, Syria. The al-Qaeda-linked ISIL and other Takfiri militant groups have targeted many historical and religious sites in Syria over the past three years, including the holy shrine of Hazrat Zaynab — the daughter of Imam Ali (PBUH) — and churches in the Christian village of Ma’loula, near the capital, Damascus. The United Nations has expressed concern over the widespread looting and damage at historical sites in Syria. As even the Shrine of Saint Owais Al Qarni was a revered Islamic Heritage Site , and was even Protected under the UN Charter of World Heritage Sites, while these terrorist have No Consideration of International Laws or Islamic Values . The country has been the scene of a deadly crisis since March 2011. The Western powers and their regional allies — especially Qatar, Saudi Arabia and Turkey — are said to be supporting the militants operating inside Syria. This entry was posted in Jafria, Middle East and tagged holy shrine, ISIL, Owais Al Qarni, Raqqa, shia, Syria, takfiri, Terrorist, Uwais al-Qarani. Bookmark the permalink.